During the BIKE Festival in Riva, international automotive supplier Brose and high-end mountain bike manufacturer Rotwild presented two fully integrated electric mountain bikes. 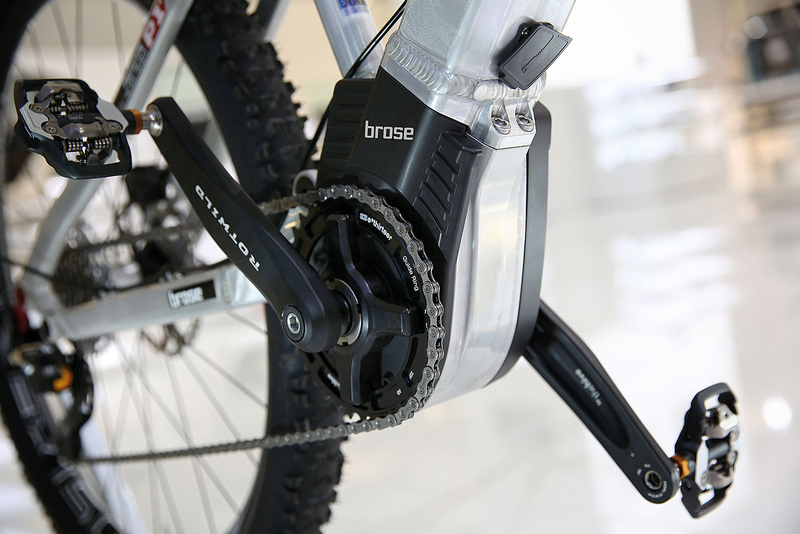 Brose is the world leader for electric motors in the automotive industry and is providing a lightweight mid-motor for the R.C1 and R.Q1 e-bikes. The two models are due to go on the market this fall. The electric motor used in the e-bikes is based on a steering motor that has already been used successfully millions of times in other applications and which has been optimized for mountain bikes over the past three years. The Brose motor is smaller, more efficient and around a kilogram lighter than competitor products in its performance class, and is virtually silent and vibration-free. The brushless inner rotor delivers 250 watts of power. Thanks to its compact design, the Brose mid-motor can easily be integrated in the frame, conserving the bike’s existing geometry. Customized casing designs and a range of positioning options offer bike developers and designers plenty of design scope. The All Mountain R.Q1 presented in Riva is a versatile e-bike for every trail and benefits from Brose’s lightweight mid-motor. The battery is fully integrated in the supporting framework, enabling the R.Q1 to retain its individual appearance and clean handling, even in the hybrid version. Even as an electric mountain bike, the 29er Hardtail R.C1 is sports-oriented: the frame has been designed throughout to maximize dynamics and efficiency and the lightweight e-bike motor from Brose provides uphill assistance. Here too, the battery is hidden inside the bike’s down tube. At the same time, the R.C1 offers greater power reserves than a pure racing bike. Rotwild, a German company, has been developing, manufacturing and marketing high-end mountain bikes since 1996. Every Rotwild bike combines top engineering with holistic design. Since the beginning, the dynamics, efficiency, performance and individual technical solutions of Rotwild bikes have made them sought-after partners on the world’s mountain bike trails and race tracks. A large number of medals and podium places at Olympic Games, world championships and world cups attest to the capabilities of Rotwild bikes. Brose is one of the top 40 automotive suppliers in the world and is the fifth largest family-owned company in the industry. Based on its long-standing experience as market leader for electric motors, the mechatronics specialist has developed an innovative drive concept for e-bikes, which was well received by industry experts. After being awarded first contracts for the drive, the company has now decided to market the drive in the premium segment specifically and start series production in its Berlin plant in June. Brose is the only supplier to offer a drive system "made in Germany". The necessary investments also helped create and secure jobs in Berlin – the town where Max Brose founded his first company in 1908.